Vrchlabí (Czech pronunciation: [ˈvr̩xlabiː]; German: Hohenelbe; Latin: Albipolis) is a Czech town in northern part of Hradec Králové Region, in the roots of the Krkonoše Mountains. It has about 13,000 inhabitants and it is situated at the upper part of the river Labe. The history of Vrchlabí started with the settlement of the Krkonoše Mountains (the Giant Mountains) – the highest Czech mountain range. The name of the town is closely related with the location on the river Labe, the Latin Albipolis (Albi = Labe = The Elbe, Polis = City). The first settlement called Wrchlab was probably founded in 1300. The most significant person in the history of the town was Kryštof Gendorf. He was a mining expert and developed the town into one of the most important metallurgy centres. Many people from German speaking lands came to work and live to the town during his reign and brought in the Lutheran reformation faith, which spread quickly in the region, supported vividly by Gendorf himself. Vrchlabí also became a place of fairs at that time. Especially linen cloth was highly desired and it was exported into Italy or Spain. Until 1918, the town was part of the Austrian monarchy (Austrian part after the Austro-Hungarian Compromise of 1867), head of the Hohenelbe district, one of the 94 Bezirkshauptmannschaften in Bohemia. 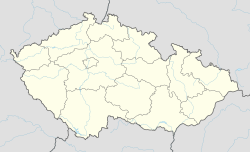 From 1938 to 1945 it was one of the municipalities in Sudetenland. The town's German who had not fled in WWII was expelled according to the Beneš decrees. The town has flourished economically since the Velvet Revolution in 1989 and has become an important tourist resort. The town was a centre of metallurgy in the 15th century. In the 16th century textiles were produced in the town. Manufacturing of organs was introduced into the town by the Tauchmann family. In 1876, winter sports started to develop in the region. One promoter of skiing was Guido Rotter, a local factory owner and the president of Austrian Ski Federation (ÖSV). Nowadays, winter sports comprises one of the most profitable sectors of the town's economy, along with the tourism industry and automotive industry, which is represented by the Škoda Auto factory. Vrchlabí provides a large variety of cultural and sports opportunities. There are many events, such as Krkonošské pivní slavnosti, Turistický pochod, Krakonošova stovka or Dny řemesel that are held every year. The Střelnice house is the centre of culture. It is a place where all concerts, plays or balls are performed. Vrchlabí is divided into several parts in order to provide better organization.